You may be asking yourself what is an altitude valve. Well it is usually installed in supply line to an elevated tank, standpipe or reservoir. Closes to prevent overflow when supply head exceeds maximum water level. Altitude valve re-opens to replenish tank when water level drops below maximum. Water must be drawn out of tank through another pipe or a check valve bypassed around altitude valve. If you see your tank over flowing, the cause could be your altitude valve. Here at Aqua Flow Service, we have the ability to diagnose and repair most altitude valve problems. Here is a list of just a few types of control valves that you may have. 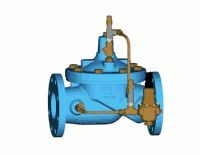 If you are not sure what brand valve you have, please feel free to hit the REQUEST A QUOTE on the bottom of the page and someone will get back with you ASAP. If you would rather talk to a live person, feel free also to give us a call.